They have almost made it: The new house is occupied, the renovation work is completed and the garden no longer looks like a construction site. But that's not enough, because in order to allow relaxation in the garden, too the garden furniture are carefully selected. Because, honestly, if the only seat is a rickety camping chair, the garden can still be so beautiful, real relaxation so not possible. If you still like to sit together with friends over a chat and appreciate the sight of rustic furniture, We recommend rustic tables and benches made of solid wood, for example from Tradoria. Such solid wood furniture for the garden are indestructible, weatherproof and appeal to all senses through their sensual natural structure. In such an ambience, a good conversation starts almost by itself. Weatherproof yes, but do you like a little more shine than just wood? Then take a look at illuminated garden furniture, such as the Glow Chairs from Alibaba. After dark it is a great feeling to sit in such a shiny piece of furniture. In order not to unnecessarily drive up electricity costs, there are now even illuminated garden furniture that uses solar energy. As a result, the furniture loads up during the day and is therefore supplied with energy at night. A supplier for this is, for example, Coleman. 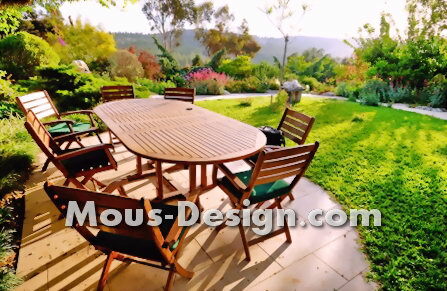 If it is to be especially comfortable, the very natural garden furniture made of rattan as of Artelia. Rattan furniture with its woven structure gives a cozy flair, captivates by its elegant appearance and can be obtained today in all imaginable versions. Is then still a pond with underwater lighting for fascinating sights and a crackling campfire from a fire basket or a fire bowl set up the comforting, relaxing atmosphere no more demolition can be done. And that without having to travel a thousand kilometers into the distance.